A brushfire continues to burn inside Hawaiʻi Volcanoes National Park. 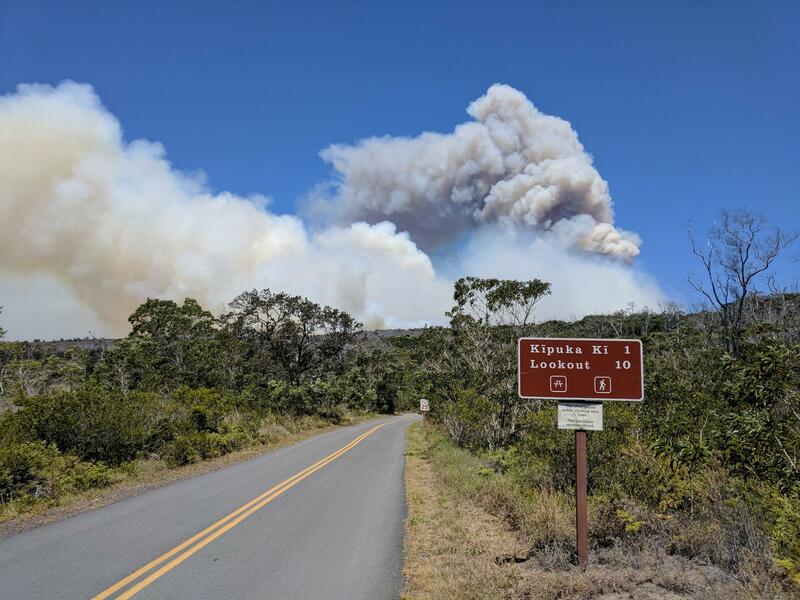 The fire started in Keauhou Ranch on August 5th, and crossed Mauna Loa Road into the park, moving west towards Kapāpala Ranch. National Park Service, Department of Land and Natural Resources, and County of Hawaiʻi firefighters are continuing efforts to control the blaze - which has scorched nearly 3,700 acres, growing another 470 acres on August 8th. Officials say the fire is roughly a mile north of Highway 11. 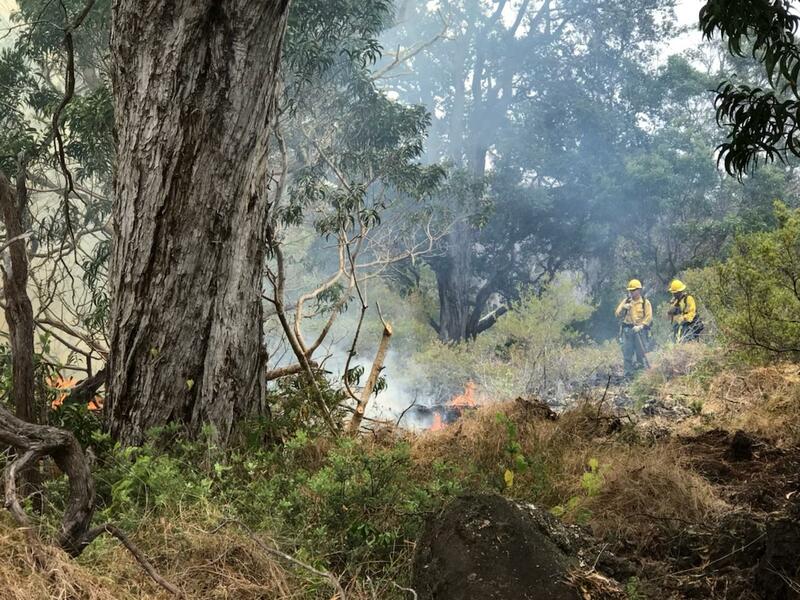 Fire crews have prevented the spread of the fire into the Kīpuka Kī Special Ecological Area in Hawaiʻi Volcanoes National Park, and have also reduced the spread towards the Volcano Golf Course community. Crews used chainsaws and hand tools to remove dry vegetation from a rugged uneven old ʻaʻā lava flow bordering Kīpuka Kī, improving the natural barrier. Crews also used five-gallon water backpacks and coordinated aerial water drops to battle the flames. Fire plume visible from Mauna Loa Road, above Kipukua Ki. Plumes of smoke are visible from Highway 11, and motorists are urged to drive with caution, roll up windows, and use air conditioning if possible. Officials say motorists should stop for emergencies only. Strong winds and dry conditions at the fire's 4,800 foot elevation have made it hard for firefighters to control the blaze with a direct attack of spraying water and making fire breaks. No homes or structures are at risk, and no injuries have been reported. Park officials say the fire has consumed more than 1,500 acres of native koa forest - which is important for endangered and endemic species like the Hawaiian hawk, owl and bat.